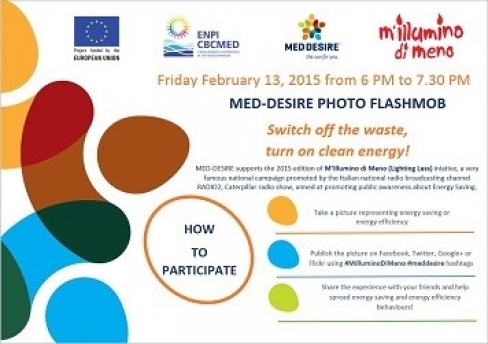 On February 13, 2015 MED-DESIRE joined M’Illumino di Meno (Lighting Less) initiative, the largest radio campaign to raise awareness on energy saving organized by the Italian broadcasting channel Rai Radio 2, Caterpillar show. The project partners decided to launch a photo-flashmob, a photo contest on Facebook and Twitter: on february 13, from 6:00 PM to 7:30 PM, the flashmob participants posted on their social accounts pictures depicting them turning on a LED light or replacing a traditional lamp with a high efficiency one, with the hashtags #milluminodimeno #meddesire. A lot of pictures arrived from Italy, Spain, Tunisia, Lebanon and Egypt: the Lebanese replaced more than 150 conventional lamps with their LED equivalent in LCEC engineering offices; Tunisian and Egyptian engineers visiting Enea laboratories shared the flashmob; Tunisian students of the Institute for the Italian Culture participated to interactive energy saving lessons; Italian followers of MED-DESIRE social pages sent pictures with LEDs and high efficiency lamps. Thanks to MED-DESIRE photo flashmob, M’Illumino di Meno initiative expanded its boundaries and landed on the Mediterranean shores, for an energy saving without frontiers. MED-DESIRE project also shared the symbolic “energetic silence” promoted by the Caterpillar radio compaign by switching off the lights of the Institute for the Italian Culture in Tunis and Puglia Region in Bari.